In late November, The New York Times pushed out a tweet about Adele that described her as a “27-year-old mother.” Readers just about lost their minds, viewing it as particularly insulting and condescending clickbait. Which it was. But the responses, such as “WTF does motherhood have to do with it?” and “Lazy, patronising, sexist way to describe” were oddly hostile as well. Now, Adele has disappointed feminists by telling an interviewer that she has found her purpose in motherhood. “When I became a parent, I felt like I was truly living. I had a purpose, where before I didn’t,” she says. “Admits,” like she’s confessing to a crime. Yes, because there are few things worse than a woman finding purpose in motherhood. 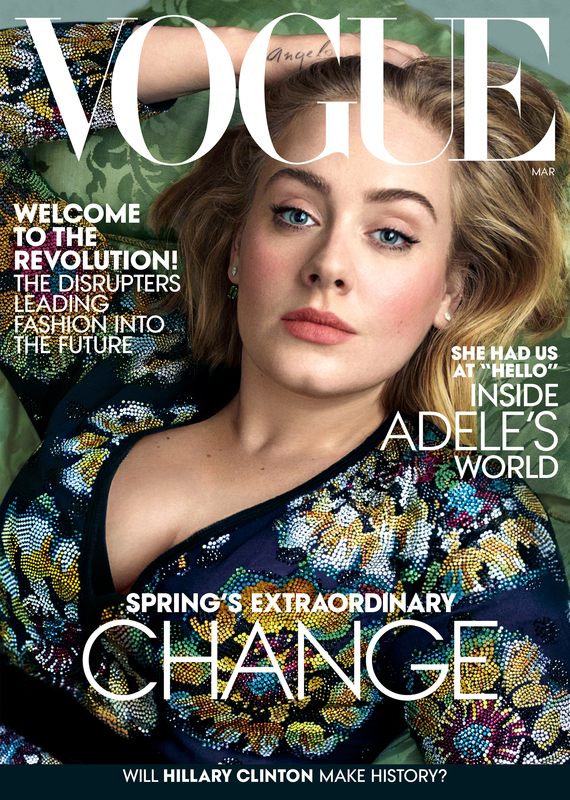 Adele appears on the cover of the March issue of Vogue dressed in a sparkly Burberry gown while reclining regally on a green silk damask couch. She looks confident and grounded, a result of, the image subtly suggests, her son. His name appears tattooed on her right hand, which she gently presses, crown-like, against the top of her head. This is a bold, potentially controversial, statement for a celebrity mom. Adele, ADELE, didn’t feel like she was truly living before she became a mom?! She, the universally adored force of nature behind, at the time, one of the bestselling albums of all time, felt like she didn’t have a purpose? The cover photo and the pictures inside are all lovely, as you might expect of celebrity photography. And Adele does exude a sublime confidence and satisfaction, although I didn’t pick up the subtle suggestions that Ms. Strauss did. But what’s the problem with what she said? And how out of touch are feminists to wrestle with this? We’re constantly told that feminism doesn’t hate motherhood or bristle against children, but it has the most unconvincing ways of demonstrating that. Most women who become mothers find purpose in that vocation. The fact is that most women who become mothers find purpose in that vocation. And unlike many fame-driven starlets, Adele has always expressed a certain ambivalence about her success. I had an awesome life before I got married and had children. Now I have a career that I’ve worked hard on and of which I’m quite proud, and I have numerous, fulfilling friendships and family relationships. But you bet I find special purpose in being a mother. Because I’m a (mostly) normal and typical mother. This is a feature, not a bug, of women. And when it comes to the fathers I know, they’re hardly any different. Even next to marriage, which is my most important relationship, there is nothing that quite focuses the mind and orders one’s priorities as becoming a mother. And it’s awesome. I’m writing this a few days after concluding a 10-day trip with an intercontinental flight, in which I landed just as my husband left to visit his parents. A few hours later, my youngest took ill, and the household has been struggling ever since. And you know what? Even this week, which has not been so great, I find my purpose in taking care of these beautiful gifts that God has graciously given me. The idea that nearly any non-life-saving job — even (or especially!) global superstar and pop icon — could match up with this work is laughable. Motherhood remains an unalloyed good for most people. Strauss decides she’s OK with Adele finding purpose in motherhood because she’s not “selling us on an idealized version of motherhood,” just that “motherhood can be a singularly powerful experience in a woman’s life, even as that woman continues to pursue achievements outside of motherhood.” Phew, that was close. So long as she continues stuff outside of motherhood, she’s cool. But woe to those women who don’t pursue achievements outside of motherhood. We will still look down on them. What’s raising healthy citizens and making a happy home next to being an office drone, you know? Americans used to joke about “motherhood and apple pie,” those things that everyone agrees are awesome. The very definition of not controversial. Motherhood remains an unalloyed good for most people, and worry or concern about those women who find purpose in it is a good indicator of the problems at the root of feminism.